Modern slavery and human trafficking are "despicable crimes" and a police priority, according to one officer. North Wales Police recorded over 100 offences in 2015-16, the fifth highest compared with other police forces in Wales and England, a report has found. Her Majesty's Inspectorate of Constabulary said forces were failing to recognise the scale of the problem. Det Supt Steven Williams said the number of cases in north Wales was "testament" to action taken by police. The force polices Holyhead port at Anglesey - the second busiest roll-on, roll-off ferry port after Dover - with officers and other specialists including a dedicated support officer for victims of slavery who has just been appointed. Wales' other three forces recorded under 50 offences combined between August 2015 and October 2016 while Greater Manchester Police reported the most with over 200 offences. The study, which looked at 10 police forces in detail, found some examples of good policing - but said that was the exception, rather than the norm. Det Supt Williams said the report "has highlighted just how seriously North Wales Police are taking this particular issue". "The relatively high number is testament to the amount of work that has been undertaken to date," he said. "We have specialist resources overseeing such crimes and will continue to take proactive action to ensure crimes are correctly assessed, recorded and investigated. "Tackling modern slavery and human trafficking is one of our policing priorities and it is vital that we continue to work with the public of north Wales and our partner agencies in order to uncover such despicable crimes." North Wales AM Mark Isherwood raised concerns in the Senedd last week about the Port of Holyhead being used for human trafficking. 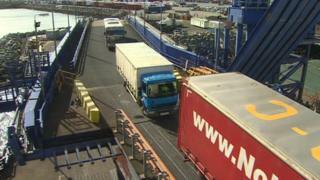 Port operator Stena Line said it had a "zero tolerance approach to modern slavery, human trafficking and child labour". "Stena Line recognises its responsibility to address and mitigate the risk of modern slavery and human trafficking in our operations," said a spokesman.